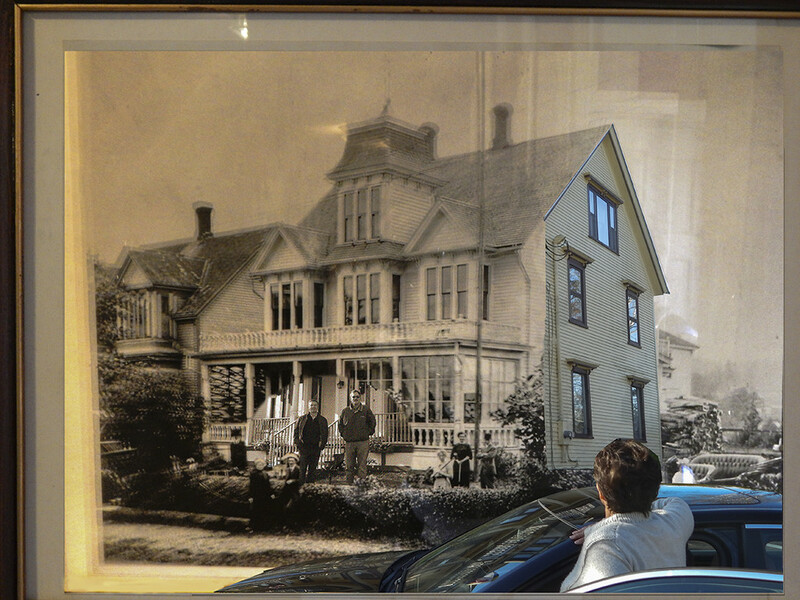 Friday morning at The Maple Inn in Parrsboro, the many old photos of this home in the foyer started playing through my mind... Could I recreate something, and how would I go about it... As the guys packed the car, I chatted with Ulrike, the owner from Austria. This home belonged to a prosperous Shipbuilder in town in 1893. He had his home photographed while seated in his new car...the first in town. A small girl in the car is now an old woman, but came by recently to see her old home, now joined by a sun room to the house next door on the left. (The same architect had designed them to have the same eyebrows & set back). ..just struck me as I looked at this... there I am, a woman traveling with two men! Oh the scandal that would have caused back then! What a great image! How fun and interesting. i like how you have done this, that's a lot of work. @chard more preparation (and no possibility of a re-do once we drove away) than the cut-and-paste collage... This is more free form...just had fun with it! Thanks! Oh you wicked women you! The whole place would've been abuzz. Love your shot Louise, and it's come out very well indeed considering everything you had to do to achieve this effect. Works for me. Louise this is fabulous!! I loved looking at all the detail and pieces. I hadn't read your description yet so when I first looked at the photo while I could see the differences I didn't pick up right away that this was melded portrait. Great job!! These are lots of fun to play with and a great lesson that we can't always believe everything we see. @golftragic @dgrynn Well you two have brought this day to a close on a high note! Thank you both so much... You, Marnie, because I was first drawn to your work because of the fabulous post editing so it delights me when I can please your sensibilities! You, Deb, because now I know you're an artist and designer behind the photographer hat you wear in our presence. Thank you for liking this, because it's loose & more like the paper collage and Mixed media I was doing before setting it aside to concentrate on the photography.It's fun to find the blending! Compliments. Beautiful done. You are a natural born photo shop talent. I LOVE this!!!!! Great job! Wonderful creation! Yes, the people look tiny - but it could also be the distortion of the old lenses/camera. Wonderful exercise....such a pleasure to read your description and try to imagine that time. Sometimes I wonder what people will be saying about us hundred years from now! oh, that is an awesome processing! i love it! i love it! i love it! i suppose a ladder to elevate the camera would give a lot better perspective. someone told me that last year, to get a straight perspective of a structure, stand as far back as your camera would allow. i was in my late teens in the early 70's and being seen with more than one boy was enough to give you a bad reputation! Woah - this is so cool! You are getting daring with the photoshopping! @ellen haha! This was so much fun because it was more like the mixed media collages I used to create! "Stick this here...cut that out and put it there..." only at the end of it all, I didn't have glue on my fingers, and there were no scraps to pick up! LOVING this Photoshop fun!